On sitting down with this book, I had a sense I'd be reading something substantial. I found that while Salvatore Ferragamo was indeed a wizard of footwear, the first chapter or so told me he's also a masterful storyteller. Ferragamo was born eleventh of fourteen children in a poor village in Italy at the turn of the 20th century. 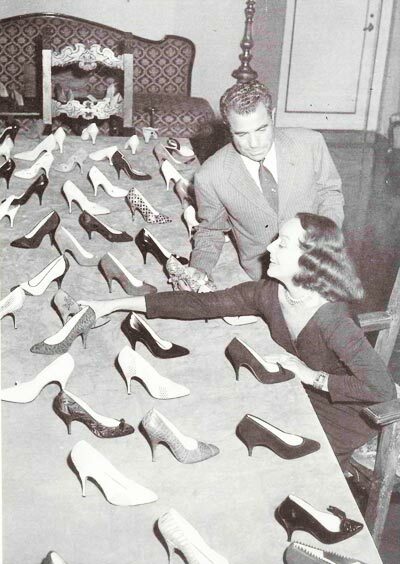 Not only did he rise out of poverty to oversee a shoe-making empire, he also shod some of the world's most famous names, from Greta Garbo and Sophia Loren to Mussolini and Eva Braun. Paulette Goddard is a good example of one of Ferragamo's more demanding clients, much to his perfectionist delight. At the age of nine, Salvatore was desperate to learn the shoemaker's trade. Just across the street from his boyhood home was a cobbler, but the Italian culture designated shoemakers as low class, and Salvatore was forbidden from apprenticing. Then one day his younger sisters were expected to take first communion at the local church, but they had no white shoes to wear to the service. His mother cried with anxiety, as they also had no money to buy such luxuries. So the night before the service, Salvatore stole across the street to the shoemaker's shop, obtained the necessary leather and tools, and stayed awake all night creating the essential shoes. They were beautiful despite the fact they were Salvatore's first attempts - a testament to his innate ability. Years later, once Salvatore had established his name as an international shoemaker, he found himself kept at close watch in his own Italian villa. The Nazi aggressors suspected him of spying and then of hoarding food. During World War II, food was in such low supply that punishment for hoarding was death. Salvatore recounted that he did have a "huge Parmesan cheese" in the house, but nothing more. Oh that cheese! I was certain it would be found. Worrying about that cheese kept me awake night after night. I dreamed more of that cheese than of any girl I have ever known in my life. It was as if it was rolling along the edge of a precipice and I was running after it... All the persecution of this period of my life... never frightened me as much as that Parmesan cheese. In the post-war enthusiasm of 1947, Ferragamo was notified he'd won a prestigious award in America along with Christian Dior and other designers. With the single-mindedness one might expect of a ruthlessly focused craftsperson, Ferragamo had never heard of Dior despite their similar lines of work. Their paths crossed in a dramatic way when Ferragamo happened to meet Dior on the Queen Elizabeth, a ship bound for America where the award ceremony would take place. The gentlemen commiserated that they'd only just finished the exclusive clothes and shoes that would debut at the award presentation during a special fashion show. After this exchange, Dior asked to see the shoes Ferragamo had created. But upon seeing them, he stared at Ferragamo suspiciously. One pair of shoes was satin with a cutaway instep, mimicking one of Dior's satin dresses with a cutaway neckline. Another shoe had a doubled drape just like another of Dior's designs. He accused Ferragamo of sending a spy into the Dior house in Paris, as Ferragamo's shoes serendipitously matched Dior's dresses beyond happenstance. Yet Ferragamo hadn't seen a hint of Dior's ideas. Not only did he know nothing of Dior, but he'd only just shared a conversation about the late work required before departing with fashions in hand. It was a stroke of genius - perhaps two strokes - that they had created "for each other" without knowing it. Additionally it heralded the heyday both designers were embarking upon in the post-war era. Shoemaker of Dreams is full of many more anecdotes, written with Ferragamo's heartfelt and intelligent point of view that reveals a deep and endearing love of shoes.